I stopped awhile back by one of my favorite markets, the Safe & Save on Sawtelle. On a stretch of “Little Osaka” that’s becoming somewhat trendy with izakayas and Giant Robots, it was — along with Satsuma Imports and Hashimoto bonsai nursery — one of the last vestiges of the Old Sawtelle. A comforting throwback to a time before chains. The store was kind of like an old pal, rumpled and friendly. It reminded me of grocery stores in old Hawaiian towns like Wailuku or Hana. Sometimes there would even be old Japanese guys sitting out in front, passing the time. I’d say hello to Ricky Tsushima, the owner — always wearing his Hawaiian shirt and cap — as I strolled by shelves of stuff on my way to the fish counter in the back, where I could ask Jorge the fish guy what was fresh that day. Which was usually everything. Then I’d wind my way around the back, past the fine frozen selection of Hawaiian foods — lau lau, kalua pig, saimin noodles — to the deli aisle, where I would find my too-good-to-tell-anyone 4 oz. package of super fresh sea urchin for $8.99. (Less than the fancy markets charged for 2 oz.) Ricky knew not to give me that penny back, and only smiled and winked if I was 10 cents short. This particular day, a sign on the door caught my eye. Closing business sale. I walked my usual route through the store, and everything seemed normal — although there were fewer things on the shelves. As I reached the register with my package of salmon sashimi, Ricky seemed happy as always. 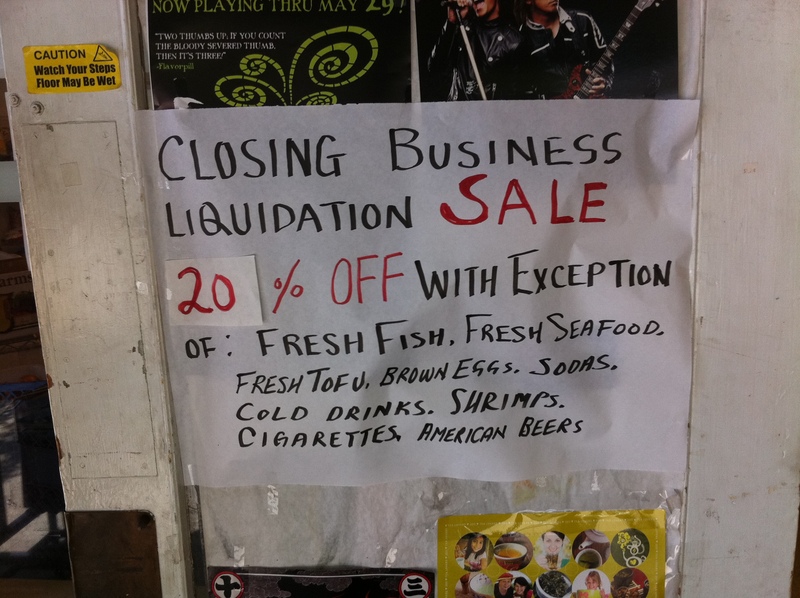 “You guys closing shop?” I asked, as if somehow the sign on the door might’ve been a mistake. “Yes sir!” he replied with a cheerful poker face, and I looked for signs of sadness in his eyes. At my next stop, the chain Nijiya Market down the block, things were busy as ever. It’s not as if sentimentality completely trumps progress — on Sawtelle, I can now get killer Tokyo-style ramen and epic Beard Papa cream puffs, or visit a world-class saké bar. Nor was it about product. There was nothing they had at the Safe & Save I couldn’t get elsewhere. The Nijiya just a short stroll away has more different kinds of fish and produce, the new Marukai chain store on Pico has a better selection of Hawaiian products. I went to the Safe & Save for something else… something intangible. I would call it soul. The difference between a Disney musical and an indie film. Not that you can’t have both — the sugary pop entertainment that feeds your sweet tooth, and the thoughtful, subtle entertainment that feeds your soul. But these days, more and more, it seems you actually can’t have both. How sad but truly told. So many neighborhood independent businesses have closed. This happened before with bookstores when the mega chains took over and now the irony is that the Border’s and such are going bankrupt as Amazon devours the book market. You are such a good writer that while I know you have a loyal following on this blog, your story should be in the LA Times, LA Magazine or LA Observed to be read by an even larger audience. Thanks Gregg, for your kind words. Oh, no! I was just there not too long ago! Ahhhhhh, I hate that stuff, I just returned from Hawaii and the island I knew is not there anymore. I was disappointed when that old Japanese market in Lahaina closed — where you could get the fish that the locals brought in that morning. Now you go to Safeway and get ahi from Thailand.